Are the PSOs having an effect? Survey suggests no, but anecdotal evidence suggests yes. Data from a survey conducted by the Australia New Zealand Policing Advisory Agency shows in 2012-13, 24.2 per cent of Victorians reported feeling safe or very safe on public transport at night. This was a small increase on the previous year, in which 23.7 per cent of Victorians said they felt safe. But the proportion of Victorians who said they felt safe on public transport at night in 2012-13 is significantly lower than the number who reported feeling safe in 2008-09 (27.9 per cent) or in 2009-10, (25.8 per cent), prior to the introduction of protective services officers. In contrast to the research (and it appears it was not limited to the stations which actually have PSOs) the anecdotal evidence I’ve heard from around the place is that many people do feel safer with them around. From what I understand, Labor now considers the PSO deployment so far gone and so popular that they won’t be rolling it back. Perhaps we’ll see a change in survey attitudes when the rollout is complete and there’s a consistent presence of PSOs on every station after 6pm. For me personally, I’ve used the trains at night for many years without incident, and while I’ve never felt unsafe, everyone’s aware that incidents can and do happen from time to time. To me, the presence of PSOs has made little difference, though at otherwise unstaffed stations, it’s nice to know there is now an official presence one could turn to if help was needed. And certainly as a parent with a kid old enough to be heading out at night, it’s nice to know more stations now have a stronger staff presence at night. Is the PSO rollout leading to more people being willing to use trains at night? I recall the Coalition saying before the 2010 election that they expected to see a patronage/revenue jump as a result of it. Has that happened? Or are other factors (generally low frequencies, and very poor connecting services after dark) holding back growth? Is it reducing crime? The article notes that crime stats are up, but given there’s been no widespread reporting of crimes against the PSOs themselves, the logical conclusion is that more crimes are being reported. These are the sorts of questions that need to be properly answered before we will know if the program is truly worth the $212 million (over four years) cost to the taxpayer. Until then, I continue to take the view based on the assault statistics — that some stations need a security presence, not just at night, but from first train to last. And that at other stations, two armed guards from 6pm onwards is over-the-top — the funding for those positions is better used for more regular staff (who provide passive surveillance and customer service), and more train drivers and the other personnel needed to run more frequent public transport, including more trains running more often. After all, it doesn’t matter how safe you feel, waiting 29 minutes for a train — after dark or in broad daylight — is still not fun. I think your anecdotal evidence is correct. The presence of PSOs is reassuring. Although my wife would not let my teenage daughters walk home from the (manned) station in the dark. One of us walks to meet the train and accompanies them home. Why do we need PSOs at stations? Some argue for platform staff. They hide at the fist sign of trouble and I don’t blame them. Has society broken down so much that our police force can’t handle law and order and we need private guards? 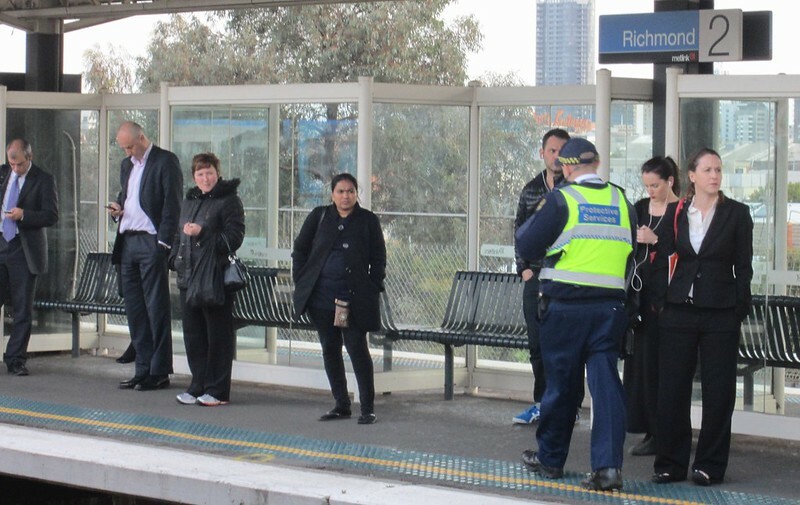 It is too dangerous to catch a Melbourne train at night without two guards with guns standing on the train platform? I am not liking where this is all heading. As a female who often travels alone at night, I think we need PSOs. If someone tried to assault me at a station, manned or unmanned, I wouldn’t want to call the police and then wait for them to show up giving the offender time to flee. It’s reassuring, particularly at some of the creepier stations on the Belgrave line (Tecoma springs to mind) to have a presence there until the last train with the ability to hold an offender until the police shows up. Offenders make use of places with little to no security and especially places like car parks – PSOs have often asked me if they want them to wait with me until my ride comes so I don’t have to stand alone in the dark. A lot of women feel unsafe outside the minute the sun goes down so having that presence is reassuring and helpful. Is that survey of “Victorians” supposed to be a sample of “all Victorians” or a sample of “Victorians who use public transport” ? If it is the former, then it is not a very useful survey result. The opinions of people who never actually use public transport is going to be based on the pre-conceptions, prejudices and what the media tells them, rather than actual fact and user experience.